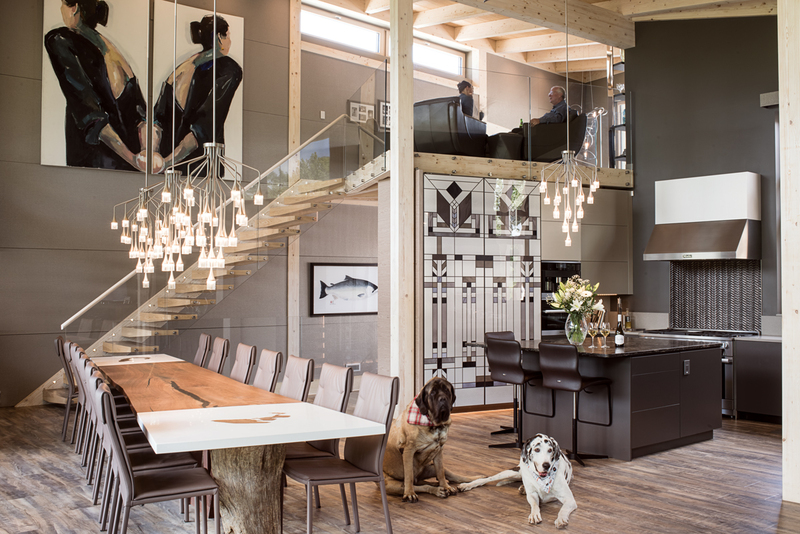 Hygge was built as both a DIRTT showcase and as the primary home for Nicki and Mogens Smed and their four large dogs. Photograph by Jared Sych; Interior design by Debbie Carruthers, DIRTT; Architect, Cheryl Link, DIRTT. Pinning down a description of the new home of Mogens and Nicki Smed is almost as difficult as defining Mogens himself. 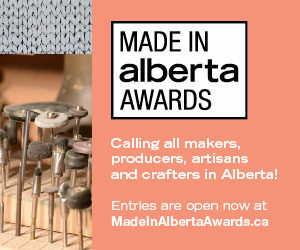 The enigmatic 70-year-old entrepreneur and co-founder of DIRTT, a Calgary-based pre-fab interior design and construction company, has been described variously as brilliant, charismatic and highly demanding. This past January Mogens was removed as CEO and given the role of executive chairman. He was ousted from that role in September. 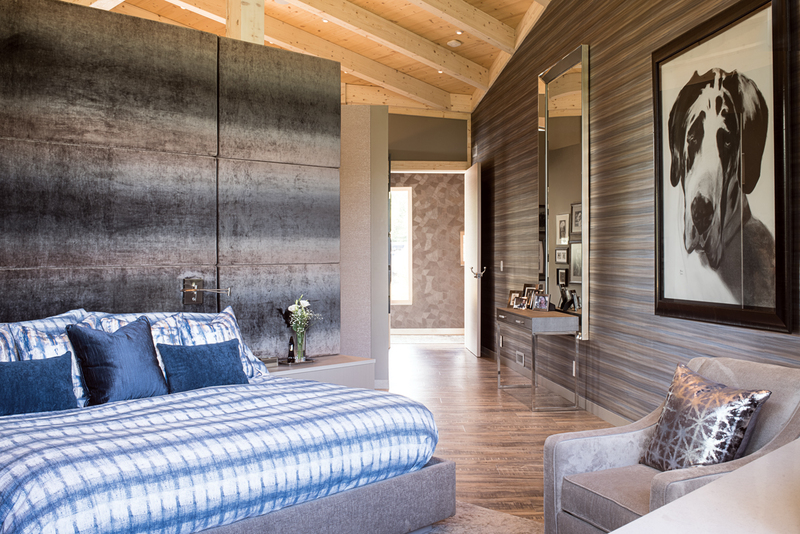 The home, which the Smeds call Hygge, the Danish word most often translated as “coziness,” was built to serve as both their primary residence and as a show suite and research-and-development site for DIRTT. 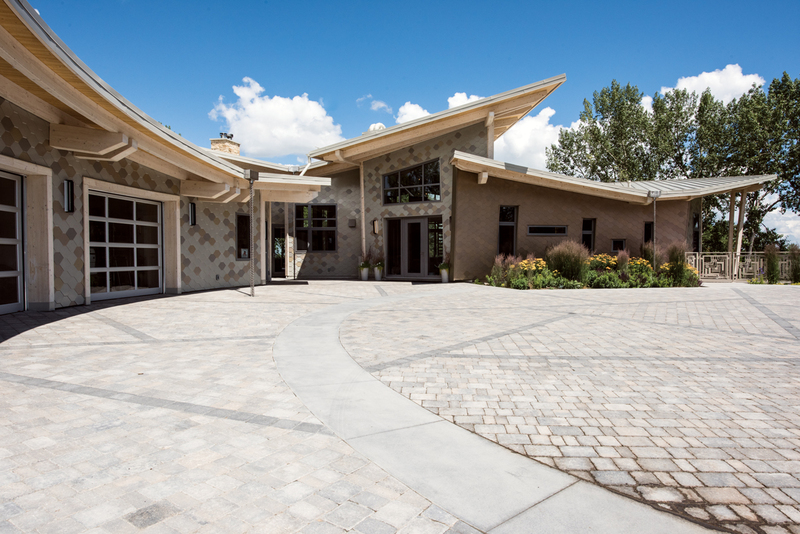 In the year since it was completed, more than 200 groups of up to 40 people toured the home. Earlier this year, the Financial Post reported that DIRTT’s fourth-quarter losses included $2.9 million related to construction of Hygge, with the Smeds paying more than $4 million in addition to that — the high costs due in large part to the research and development aspect of the innovative construction process. The Hugh Short-designed laser-cut metal panels used as a gate to the deck are inspired by Frank Lloyd Wright’s designs. Photograph by Jared Sych. 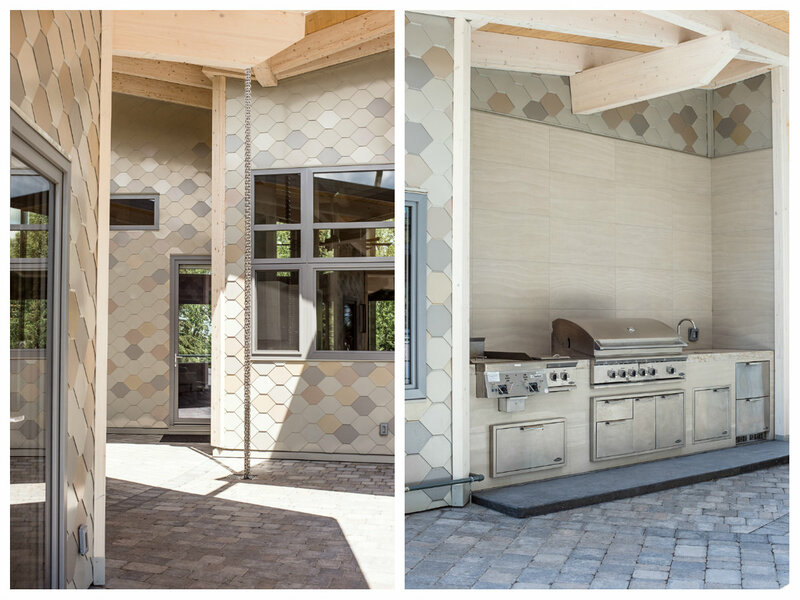 There’s an outdoor kitchen at the front between the garage and the house. Photograph by Jared Sych. A look at the deck along the back of the house. Photograph by Jared Sych. 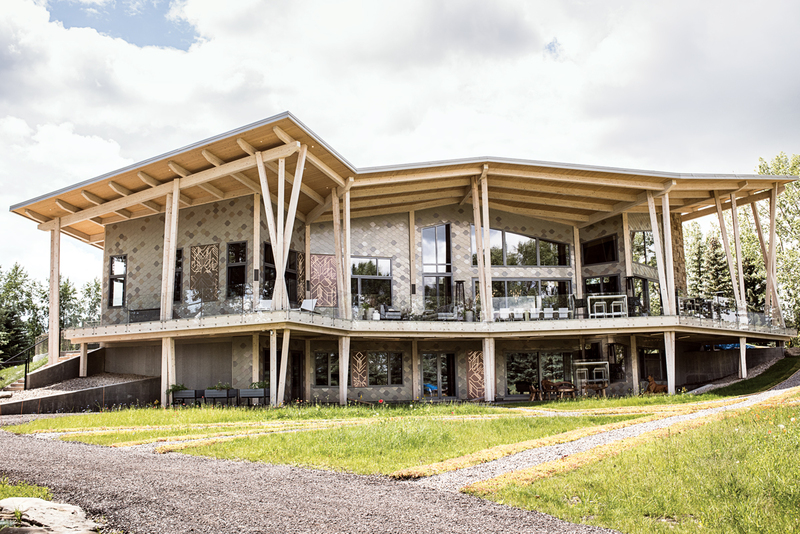 While the term pre-fab usually conjures images of boxy and bland modular construction, with Hygge, architect Cheryl Link has used the advantages of the factory-made walls to craft angles and arches that would be nearly impossible to create by hand on site. “The computer doesn’t care if there are 90-degree angles,” says Mogens, “it can be whatever angle you want.” And so instead of being set at right angles, the walls lean and curve, creating a sense of great space and even movement. The exteriors of the home and the garage are covered in metallic tile in a variety of tones that catch and reflect the changing light. Inside, DIRTT interior designer Debbie Carruthers has also used subtly reflective metallic wall treatments in many rooms, brightening and opening the space. “It’s almost vulgar to say that this house is small,” says Mogens. At the same time, it is surprising to learn that Hygge comes in at 2,900 square feet on the main floor — the space feels much larger. Knowing that the Smeds used to live in what is now the Azuridge Estate Hotel, it is a bit disarming to see them and their four enormous dogs (a Great Dane, two British mastiffs and a standard poodle) living large in a normal-sized home. 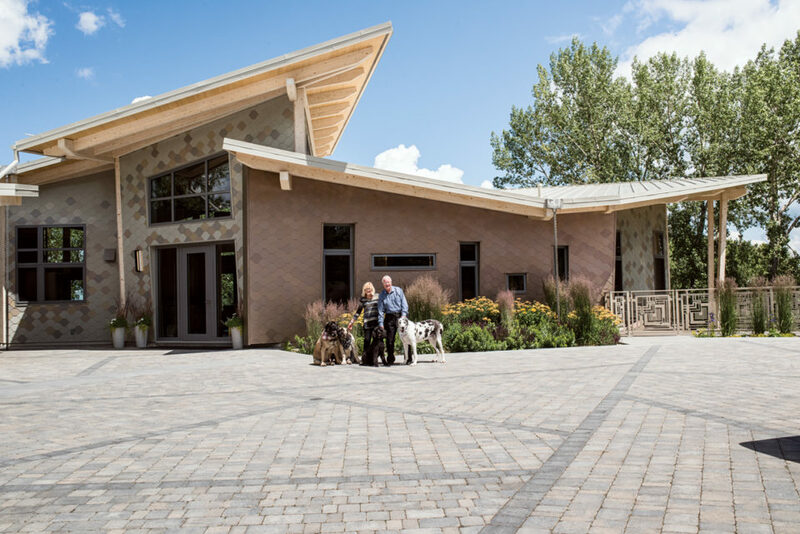 “Our Priddis house was 18,000 square feet and would feel crowded very quickly just because of the way the spaces were broken up,” says Mogens. In Hygge, Link spent a lot of time figuring out how to make this much smaller space feel expansive and ready for the large groups that it would host. The main living space’s open concept allows for easy entertaining of large groups, while the lofted sitting area is a cozy space that is away (but not entirely separated) from the action. Dining-room table designed by Debbie Carruthers, fabricated by Live Edge Design Inc.; Cattelan Italia high-back dining chairs from Finesse Furniture & Interiors; Patrona Pendant chandeliers from Tech Lighting; Wall panel fabricated by DIRTT with Zorel Panel Fabric by Carnegie Fabrics; Painting on stair well by Bev Tosh, represented by Masters Gallery Ltd.; Antolini Kosmus Island Stone Countertop from Stone Selection Ltd.; Miele Range from Jerome’s Applicance Gallery Inc.; Willow Glass side-swipe pantry doors fabricated by DIRTT; Kitchen Cabinets by DIRTT; Kitchen cabinets by DIRTT (with some drawer inserts by Richelieu); Cattelan Italia stools from Finesse Furniture & Interiors; Kitchen backsplash from Tierra Sol Ceramic Tile. Photograph by Jared Sych. 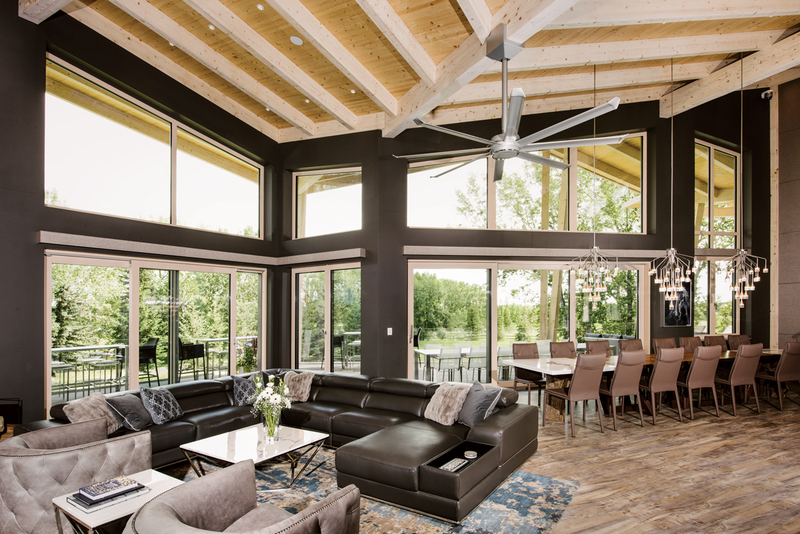 Large expanses of triple-paned windows allow the light and views in without sacrificing energy efficiency. The pre-fab construction allows for the walls to each be at different angles, creating visual interest. Photograph by Jared Sych. 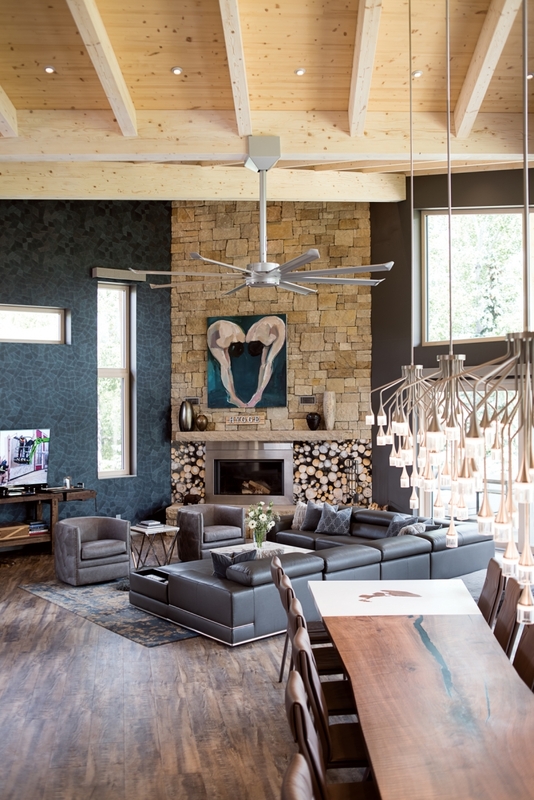 Natural materials such as the wood timbers and the stone fireplace integrate seamlessly with the high-tech panels, such as the willow glass printed with a log graphic next to the fireplace. Custom fireplace by DL Artworld Ltd., 462 Grotto Rd., Canmore, 403-679-9788; Art over fireplace by Bev Tosh; Custom log print on willow glass (adjacent to fireplace) designed and fabricated by DIRTT; Living-room wallcovering from Metro Wallcoverings; Living-room chairs from Bondars Furniture. Photograph by Jared Sych. the private areas of the home both create the illusion of a larger space. Link has also positioned the interior doorways to all open to views of the outside, drawing the eye out. Aging in place was another key consideration in the design. Carruthers selected fixtures, door knobs and other hardware throughout the home that accommodate easily for arthritis or other disabilities, the doorways are wide enough for wheelchair accessibility and most of the home is on one level. But for now, the loft space Link created overlooking the living-dining room area is a cozy refuge that Nicki says is her favourite spot in the home. Carruthers used DIRTT walls for the interior and the building processes and materials were selected for their sustainability and low environmental impact. However, the use of high-tech wall panelling, laser-cut metals and the latest in everything from triple-paned windows, to wiring, to cabinet hardware is less noticeable than the overall feeling of natural materials and complementary colour schemes. All of which, of course, makes Hygge so exceptional. In terms of architecture this isn’t what you expect of pre-fab and in terms of the interior design this isn’t what you expect of wall paneling systems; it is all so much more. 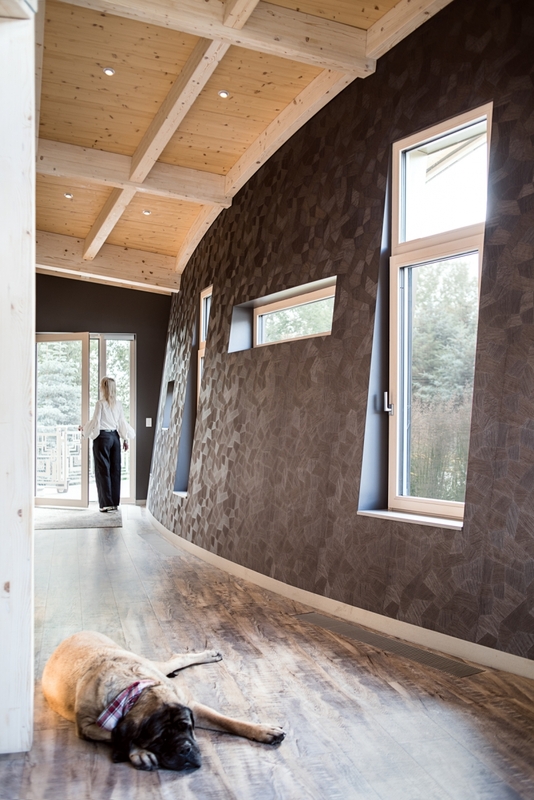 The curved hallway wall is at a greater-than-90-degree angle to the floor — a feat of engineering for conventional construction methods, but easily handled by the factory-made pre-fab construction. Arte Monsoon Collection (facet pattern) wallcovering in hallway from Metro Wallcoverings. Photograph by Jared Sych. All four dogs often sleep in Nicki’s bedroom, but despite being a canine refuge it is still a glamorous retreat. 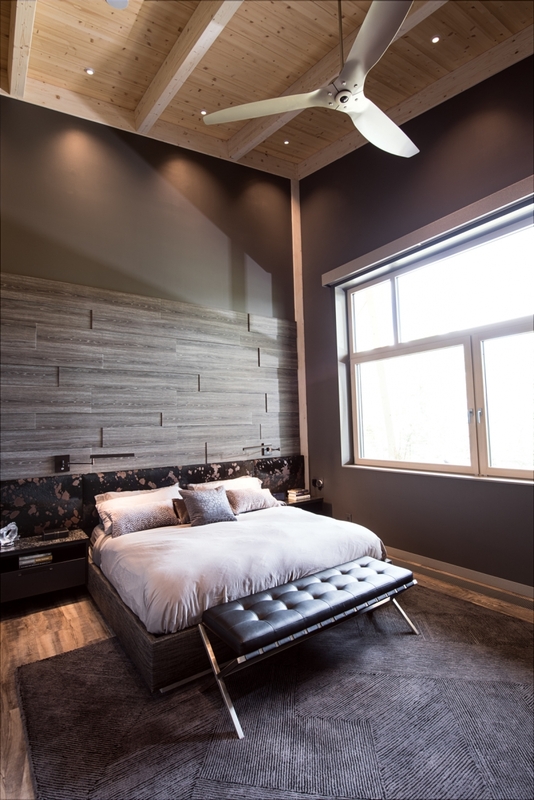 Sconces in bedrooms from Cartwright Lighting. Custom furniture built by DIRTT is accented with a variety of pillows. Photograph by Jared Sych. The home is designed with two principal bedroom suites. Both feature DIRTT panels for the headboards and were laid out so that great views were visible from the bed. Photograph by Jared Sych. Throughout the home, designer Debbie Carruthers used a neutral colour palette to create a timeless look. 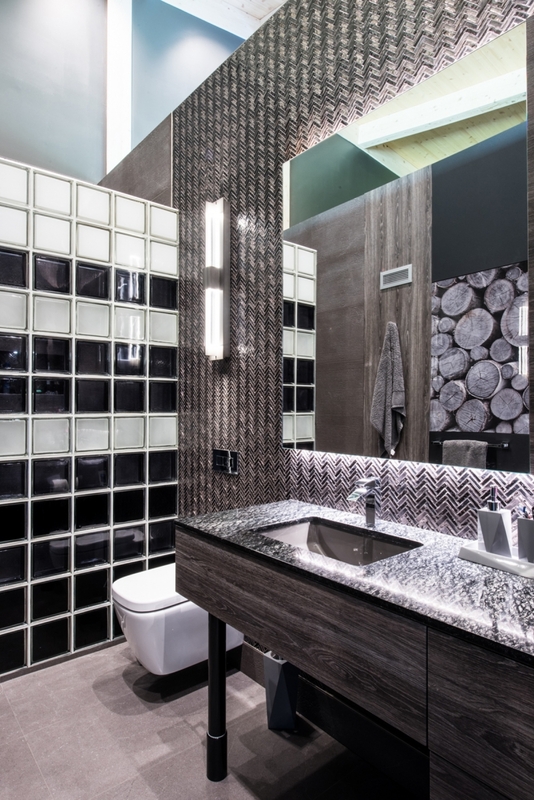 Harmony Arrow tile on bathroom wall from Porcelanosa. Photograph by Jared Sych. DIRTT built Hygge to showcase its capabilities and to test its materials and procedures. The home is the first building the company built from the ground up. Here are five ways it marries the past and the future of design and construction. 1. Architect Cheryl Link designed the home with paper sketches and physical models. Her designs were translated into a digital platform and a virtual reality space and finally made into files for the factory production of the walls and roof. 2. The style mimics timber-frame design, but the timbers don’t breach the exterior walls, cutting down on thermal-bridging heat loss. 3. New-growth sustainable forest wood was used to create the factory-made cross-laminated timbers. The structure was put together with centuries-old techniques of mortise and tenon and dovetail joints; the only metal connection in the whole house is in the sheer plates at the bottom of the timbers. 4. Among those who have toured Hygge are executives of the Frank Lloyd Wright Foundation, who said that the home “celebrated the spirit” of the iconic American architect. The inspiration can be seen most clearly in the custom DIRTT pantry doors in the kitchen and the laser-cut metal panels used in the hallway and outside along the garden. 5. Hygge house was designed to stand the test of time. “You have to build for generations. We really designed this for our great-grandchildren,” says Mogens.